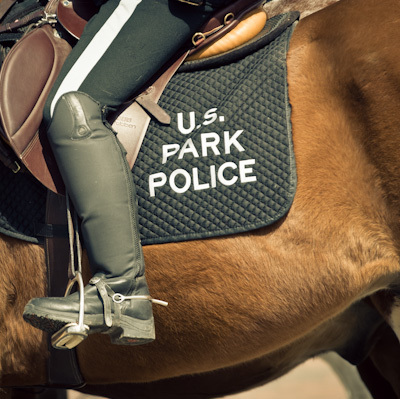 United States Park Police, Mounted Division. Washington DC. – We find there is no First Amendment right under our governing law to observe and record police officers absent some other expressive conduct. – Fields and Geraci essentially concede they spoke no words or conduct expressing criticism of the police before or during their image capture. They instead want to persuade us “observing” and “recording” police activity is expressive conduct entitled to First Amendment protection as a matter of law. In their view, observing is a component of “criticizing” and citizens may engage in speech critical of the government. We find no controlling authority compelling this broad a reading of First Amendment precedent. This Judge thinks observing and recording police is against the law! This means if you wanted to, say, take that groovy new camera you got for Xmas down to The National Mall and make a video–accompanied by stills–of your hometown for your YouTube friends and followers, and you wanted to include everything you think that makes up the fabric of your DC life experience: museums, Memorials, restaurants, galleries, parks, tourists, cityscapes and yes even police officers, Capitol Hill Police, Park Police riding by on horseback… you know, just observing the daily life of your city… this judge thinks you are not protected by the First Amendment! He thinks it would be OK for the police to arrest you and fine you for the innocuous act of taking their picture or making a video that happens to have them in it. Here is the ruling in full. You should read it.